The Washington Ballet performance of ‘The Nutcracker.’ Photo by Theo Kossenas. Among the holiday season’s many happy tidings is the arrival of The Washington Ballet’s annual production of “The Nutcracker,” staged to beautiful perfection in the gilded loveliness of Warner Theatre. It’s a visually dazzling, joyous pageant that nicely marks the holiday season. 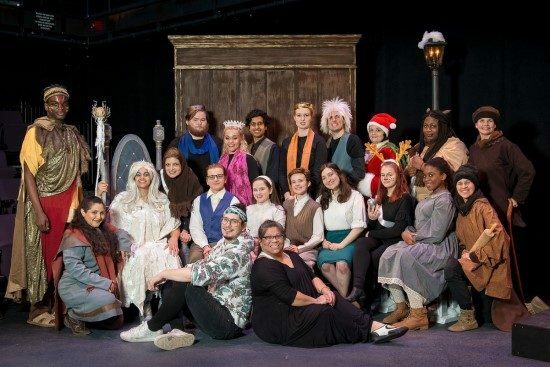 This very D.C. version of the classic tale opens in snow-dusted Georgetown on Christmas Eve. Clara (Alexa Torres), a young girl, eagerly awaits her family’s Christmas party. The merry hustle and bustle of the party see the arrival of guests including her godfather, Mr. Drosselymeyer (Stephen Nakagawa), an eye-patch wearing magician of sorts, who brings gifts and entertainment, including a Nutcracker Doll for Clara. Delighted by her present, Clara creeps downstairs that night to see it, becoming entangled in Drosselmeyer’s magic, which shrinks her down to toy size, while also bringing all the toys to life. Her brother’s toy soldiers battle with an army of rats, ruled by a Rat King, with aid from Clara and the Nutcracker, now transformed into a prince (Rafael Bejarano). The Rat King vanquished, the Nutcracker leads Clara through an array of fairytale lands. Alexa Torres is radiant as Clara; an expressive performer, she conveys Clara’s terror, delight and wonder equally well. … a visually dazzling, joyous pageant that nicely marks the holiday season. And there is much for her to wonder at. The production is gorgeously, impressively mounted. 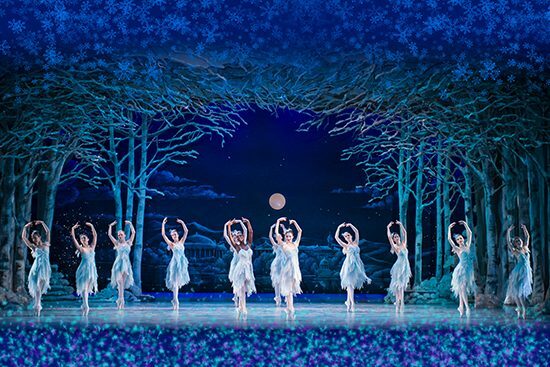 Peter Horne’s set design is a storybook crafted wonderland – after the battle, Clara and her Prince pass through a beautiful winter landscape, full of silvery sparkling trees, with falling snow adding another layer of magic to the performers’ dancing. Judanna Lynn’s costume design adds to the visual feast; the Christmas party’s late 19th century gowns are vibrant silks and patterns that resemble wrapped gifts. Audiences will enjoy the D.C. specific touches to the story. Drosselmeyer’s entertainments during the party include a charming set of dancing automatons, Miss Liberty (Ayana Kimura) and John Paul Jones (Alex Kramer), in matched patriotic red, white and blue. The battle between the toy soldiers and the rats, one of the most impressive, and fun, interludes of the show, outfits the soldiers as minutemen, facing off against a rat King who very much resembles George III. The high action of the first half gives way to an equally dynamic second half full of dance showcases. Clara’s prince introduces her to a magical world ruled by the Sugar Plum Fairy (EunWon Lee), which includes a menagerie of magical creatures. Septime Webre’s choreography allows performers of all ages to showcase their considerable talents. The dance of the waltzing cherry blossoms features a very elegant Dew Drop Fairy, whose dancing sparkles under the frothy pink flowering trees of the springtime set. Frontiersmen and women in buckskin and fur hats bound onto the stage, with a very dynamic soloist. These performances build towards the pas de deux by the Sugar Plum Fairy and her Cavalier, an exquisite masterclass backed by the soaring strings and brass of Tchaikovsky’s score. EunWon Lee excels in the iconic role, and Gian Carlo Perez brings a vivid, dynamic flourish to the Cavalier. It would be impossible to list all the reasons to the see this production (Adorable mushroom hats! Clown acrobatics!). I’ll simply say that it’s a wonderfully festive show that can and should, be enjoyed by the whole family. Running Time: About two hours with a 15-minute intermission. “The Nutcracker” runs through Dec. 28 at the Warner Theatre. For tickets or more information, click here.